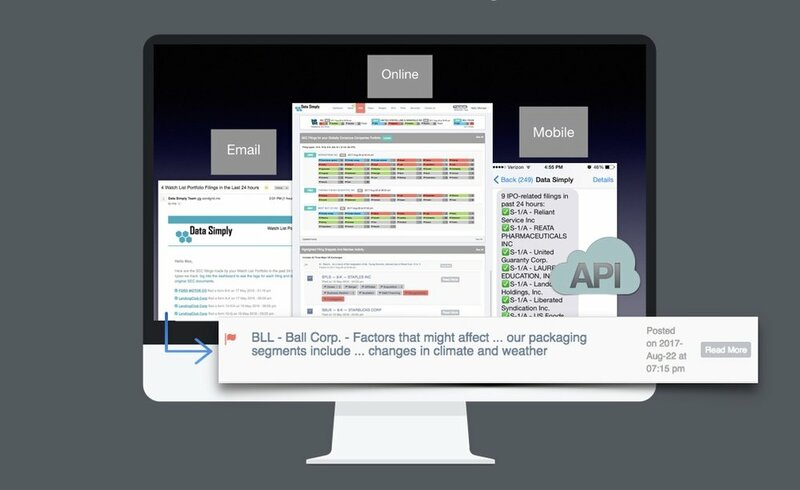 Data Simply is accelerating the world's transition to sustainable investing, offering an objective, automated, transparent approach to analysis. We leverage AI and combine ESG (Environmental Social Governance) with financial sentiment. Data Simply uses machine intelligence to see insights from words, also known as "unstructured data", and turn those into investment signals. We use our proprietary semantic engine to analyze large volumes of words in company SEC filings disclosures. It lets you easily get beyond the numbers. We include ESG and Financial Sentiment signals. We make this data and software for financial professionals. Now asset managers can meet their investing goals, asset owners can make sure oversight is complete, and advisors can help their constituents better. Developed by our team with deep financial services and engineering expertise, our technology is used by some of the largest financial firms in the world. CURIOUS ABOUT our unique investing data? We use our Financial Intelligence Engine to machine-read SEC filings disclosures for ESG and Financial Sentiment signals. We find what is hidden in the data so you can be proactive.